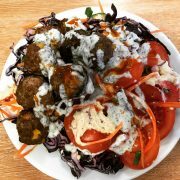 Popular Narberth and Aberystwyth Deli Ultracomedia’s Cardiff venue launched late last year after taking over the old Burger King building on the corner of Westgate Street and breaking from tradition they’ve rebranded the restaurant and deli Curado. Don’t worry they’ve had a refurb with exposed brick in white, new bar with seating around it and a deli set up in the corner to buy all the ingredients on the menu at the tapas and pintxos style restaurant. I’d popped in to sample some of the plates during the Christmas holiday’s and then a few days later after being suitably impressed for a low key NYE nibble and beer sampling before midnight. 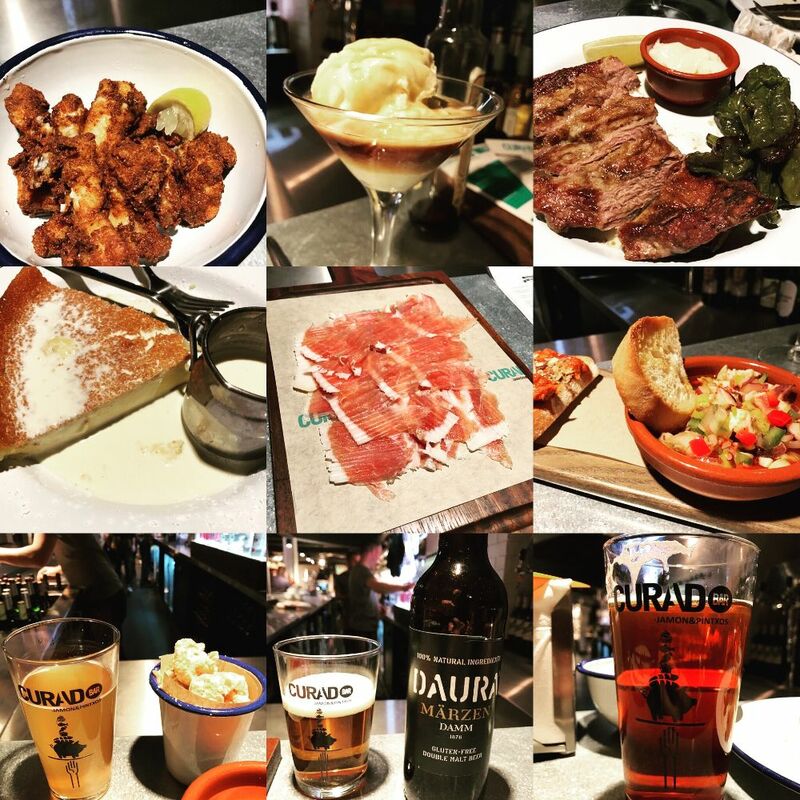 I’ve called in for the glass of vino and beer since then but not taken another stab at finishing off where I had left off on the food menu until yesterday so I thought I’d grace the visit with a blog post and review seeing that it’s my 3rd visit. I was also spurned on by the offer of two De La Cocina plates for £6.95 with Wriggle and seeing that it was two of us we got 4 for £13.90 up to the value of £26. 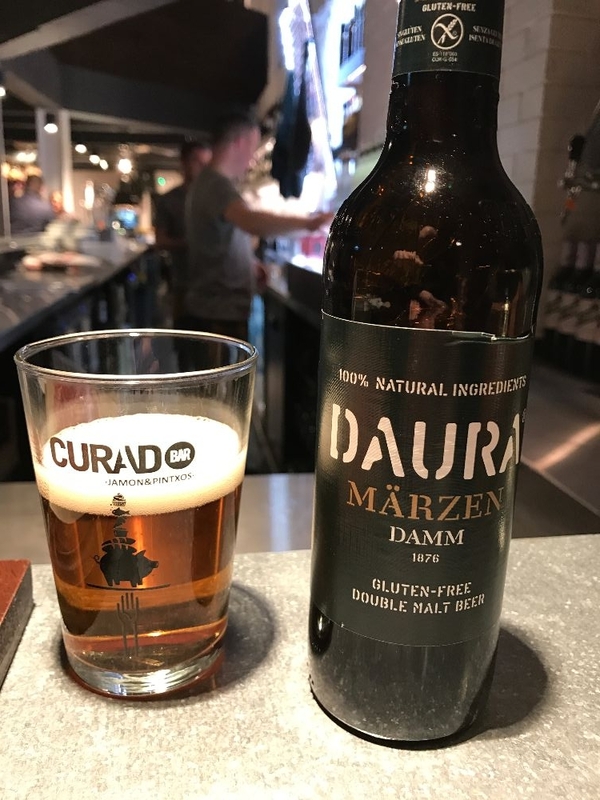 There are 3 beers on tap at Curado. 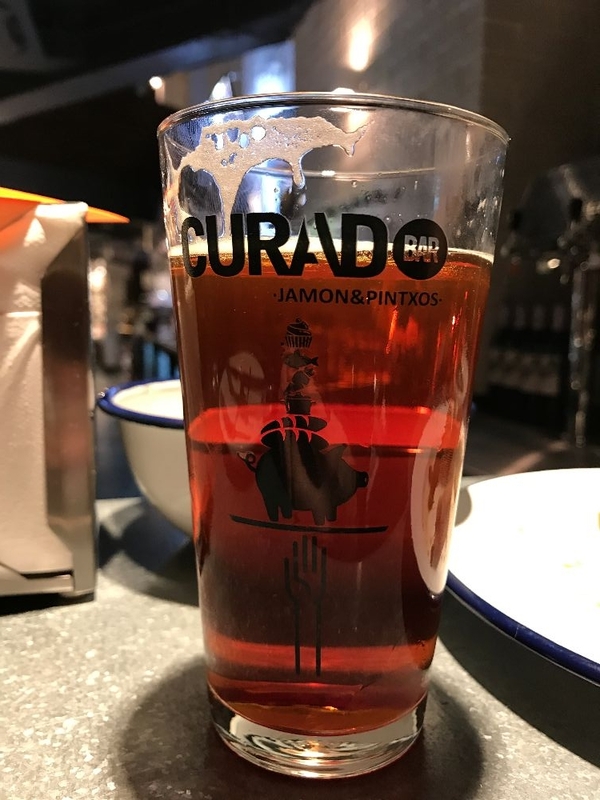 They have their own brew, sea water based El Baroque and sherry barrel aged Torro that come in a choice of 3 glass sizes along with a selection of Spanish beers in bottle too. I’ve tried all three in previous visits and taken a bottle of Torro home to enjoy at my own leisure. All three were more than palatable but I’d not sampled any of the bottled options on the menu. Curado have an extensive list of wines by the region although I found the menu somewhat confusing as they are categorised by region and not by wine type so you get white, red and rose all mixed up within each wine region. 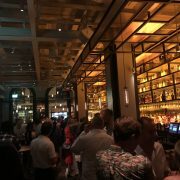 The person serving behind the bar has always been more than helpful choosing a good wine though and offering samples of each to find the perfect match to your preference. On to the Gin’s. 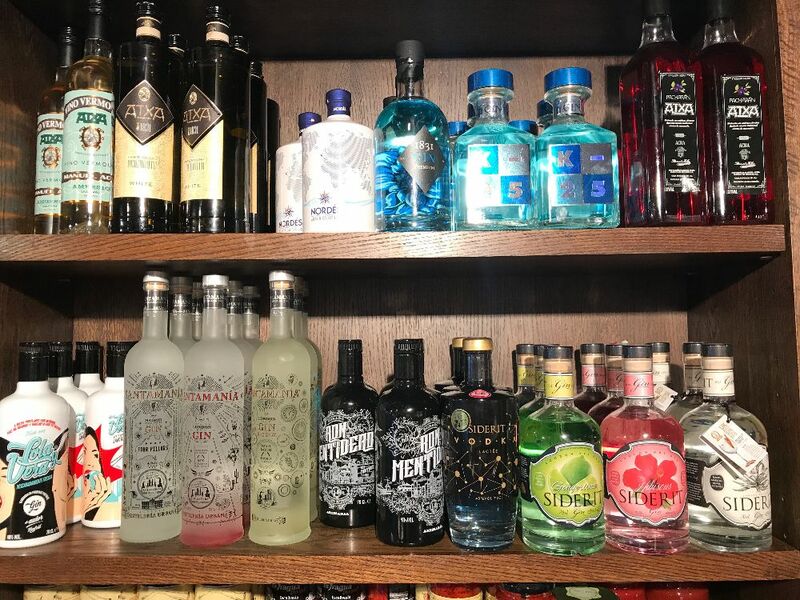 Last but not least and seeing that a lot of the produce is imported from the Galician region of Spain I was delighted to see they stock mine and Mwsh’s favourite gin, the white grape based Nordes, which takes centre stage on the wine shelf at home. There’s no Gordon’s here thank God and there are a few other Spanish Gin’s I’d not laid eyes on previously. The manager kindly gave us a small sample of some of the other Gin’s in the collection after frequenting the venue regularly since opening. The food menu at Curado is split out into different sections. You have the bit’s to pick at, tinned stuff, from the deli, from the kitchen then pintxos with either meat, fish or veggies. Oh and a nice little selection of desserts. What i’d call beer snacks on the Para Picar section translated at bits to pick at. This featured olives, bread and oils, salami sticks and Iberian pork scratchings. 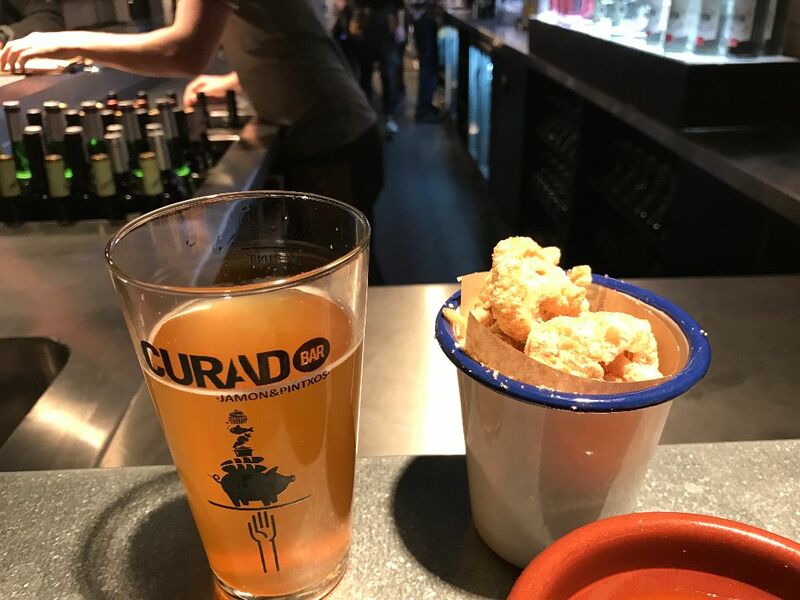 From this I tried a generous portion pork scratchings priced at £4 on a previous visit and as the menu suggests they pair very well with a Torro beer. We’ve had the Spanish bread with oil and garlic mayonnaise 3 times now because who doesn’t love bread, olive oil and vinegar with an added bonus of the mother of all garlic mayonnaise to dunk in. I’m sure the two previous occasions it came warm and freshly baked in a small loaf but Sunday it came cold and was disected from a large circular loaf I noticed behind the counter when I came into the restaurant. Still good but nothing beats a freshly baked bread. From this section I’ve tried the octopus in onion, peppers and vinegar. A bit like a seafood salsa, this was enjoyable but with strong pungeunt flavours from the onion and tartness of the vinegar against the somewhat mild flavoured octopus, it was hard to make the favour of the octopus from the rest of the dish. Also from the deli I’ve tried the White Pig. Shavings of Iberico pork arranged in army formation on my plate. Teamed with the pork scratchings they give a double hit of porky fatty lusciousness. My favourite part of the menu and where I’ve been working my way through on my 3 visits to the Cardiff tapas bar. 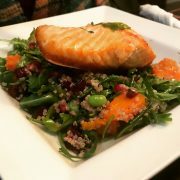 Most of the rest of the menu is pre-prepared, sliced or emptied from a tin cold but the kitchen is where it’s at with it being freshly cooked to order. Tatas bravas always sound more appealing that what you are presented with whenever I order them. Perhapds it’s just my expectations of little crispy potato nuggets like nanny Carole’s charred and crunchy roast potatos she piles high on my Sunday Roast but what I always get is small unseasoned, anaemic chunks of potato. These were cooked a little better but I’ve never had a really good, crispy, fatty potato in my tatas bravas. Maybe the potato should be boiled a bit and fluffed up before frying but I’m still on the quest for the perfect tatas bravas. The alioli does try to make amends with strong garlic punch in the face. Onto mine and Mwsh’s favourite dish the Champinones al ajillo or the garlic mushrooms in cream and sherry on toast for those not conversant in Spanish (like myself). These are unlike any garlic mushrooms you’ve ever tried, trust me i’ve had a few. 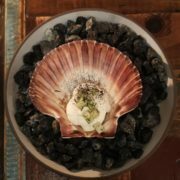 The addition of sherry to the mix turns your average garlic muckroom on steroids. 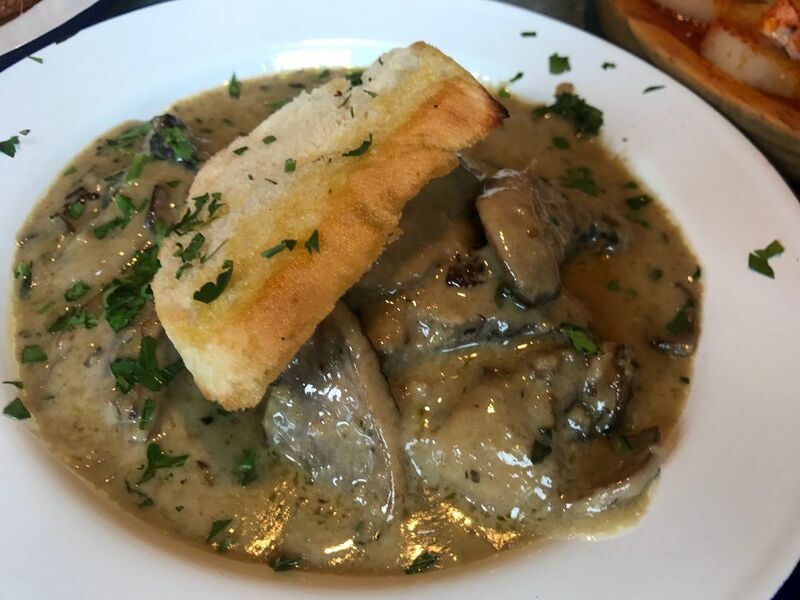 You might want to order an extra loaf of bread just clean the plate of any remnants of the creamy sauce. 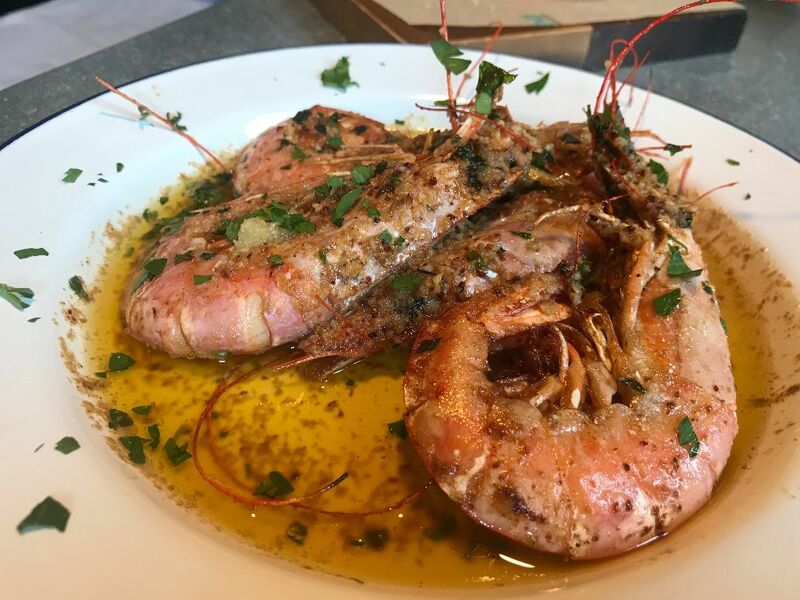 Next up are the Gambas al ajillo / 4 Atlantic red prawns cooked in garlic butter. Priced at £6 in my eyes these were no less juicy or smaller that the £16 one I’d ordered in Asador a month earlier and you get 4 of the buggers for £10 less. 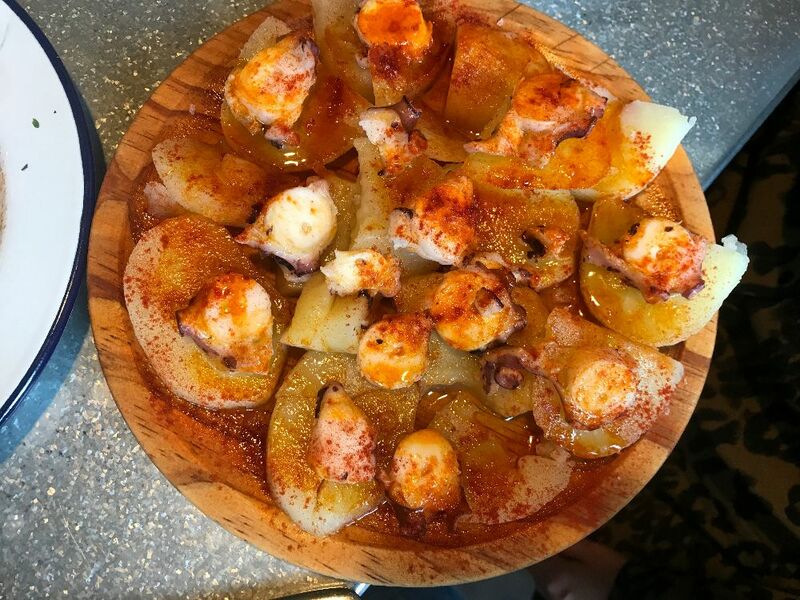 The sliced octopus on warm potatoes with oil and paprika was probably both our least favourite dish we’ve ordered there. It was all just a little too bland for our liking, apart from a sprinkle of paprika on the potatoes there was no seasoning whatsoever so we had to douse them in salt and pepper but even then there wasn’t much to write home about with the octopus, which again seemed very bland in comparison to some of the other dishes we’ve sampled there. If there’s ever squid or calamari on a menu we can’t not order a portion to nibble on wherever we are and we did try the chipirones NYE, which I found to be fine but Mwsh thought they were overly salty and a bit chewy so we skipped them this time on Sunday. We’d tried the adobo marinated school shark deep fried with lemon previously and opted for them again Sunday as I enjoyed them back in December. 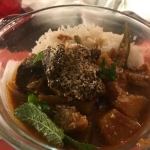 They delivered again on Sunday, slightly spiced and fried yet tender and flakey meat doused in lemon juice they married well with the vino blanco we were sipping. It didn’t come with it but we had some garlic mayo left from the bread and this went perfectly with the white fish so you might want to try asking for a portion with yours or they should consider adding a pot with the dish as it was a lovely addition. We didn’t opt for it Sunday but I did try the garlic and thyme marinated iberico pork, pan fried with lemon and allioli and basque peppers previously. 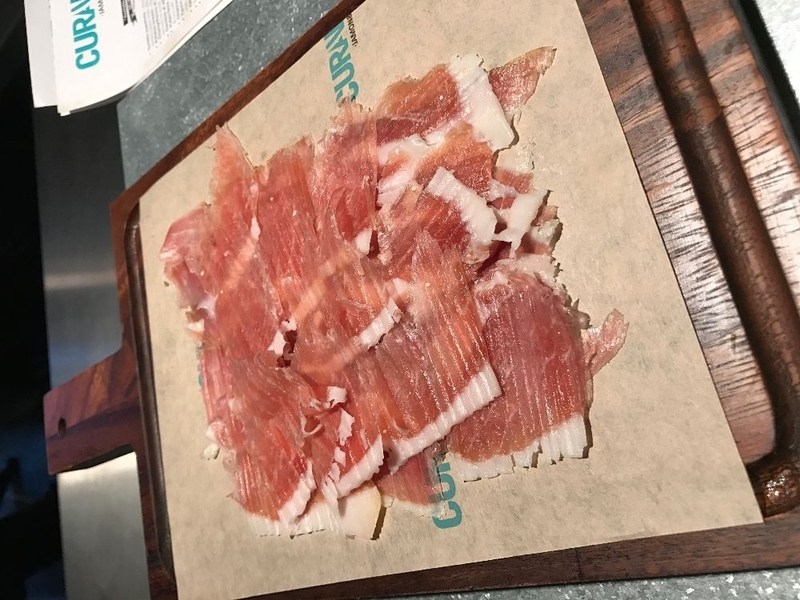 A nice meaty dish after trying mostly fish dishes and very generous on the portions compared to the portion sizes of some other local tapas bars. 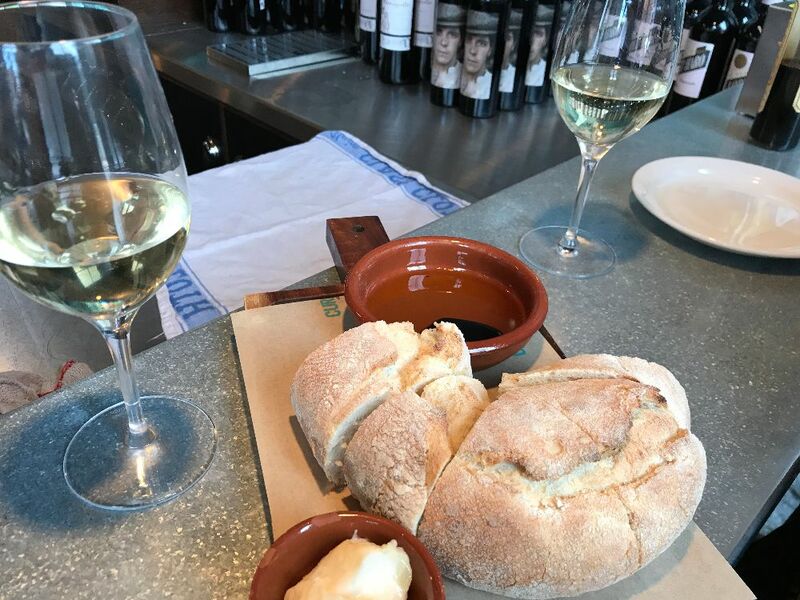 Although we never ordered it and it’s something for the next visit but someone sitting behind us had the strong goey ewe’s cheese baked in a pot fondue style and served like camembert with crusty bread and jamon butter and it looked devine. At £17 I thought it was a little steep compared to the reasonable pricing on the other dishes although it did look twice the size of a serving of camembert but the amount of bread it came with could of been a bit more generous. Brings me back to my constant frustration of having a council brick slab of pate and one triangle of bread to spread onto. This was confirmed when the dinners had to order an additional portion of bread to mop up the cheesy bowl of heaven. 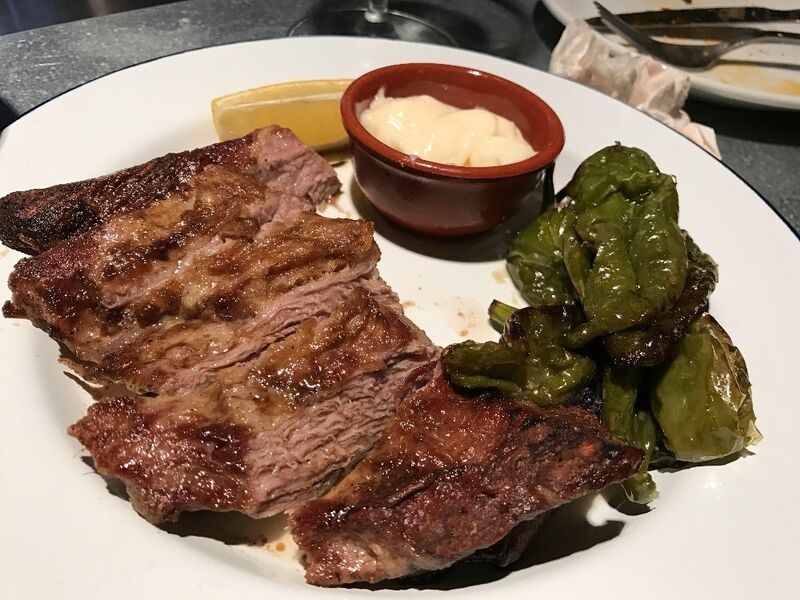 I didn’t realise they also did Chuleton or dray aged 4 year old Galician beef a la Asador although Asador’s is 8 year old and dry aged for at least 40 days as oposed to 21 days here at Curado. The price did reflect this though coming in at £55 per kilo compared to Asador priced at £85 but I’m not sure how the breed compares as Asador use Galician Blond. Most people have probably heard of tapas but I’d only heard of Pintxos as I build a website a few years back for a spanish chef who caters for paella and pintxos at food festivals. Pintxos is basically little bit sized pieces of food speared through a piece of bread. This could be peppers, olives, cheese, fish or cured meat. Priced between £2 or £3 per piece, hese are handy if you just fancy a light snack and not a full on assault on the belly with a spanish feast. 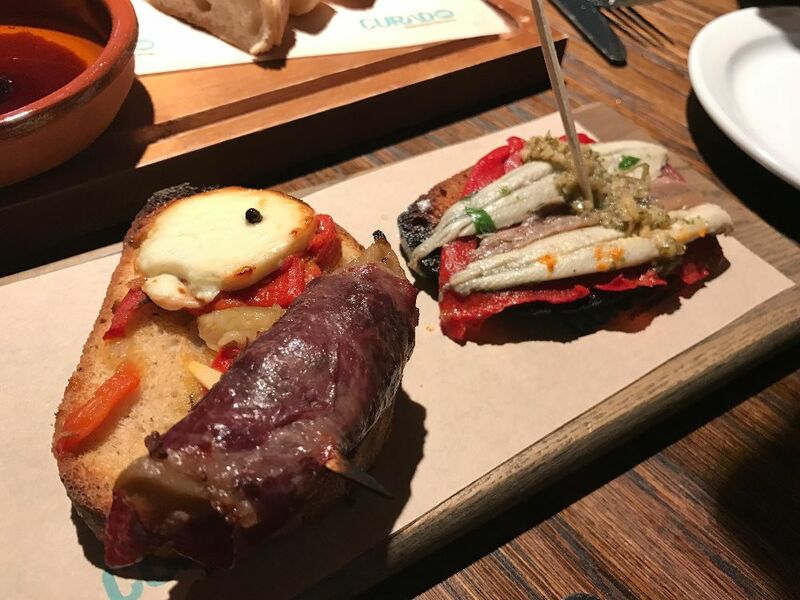 We tried the air dried beef and the anchiovy, boqueron and piquillo pepper with salsa verde pinxtos on a previous visit, which we both enjoyed but we had ordered enough bread and stodge this time already so we skipped this section. 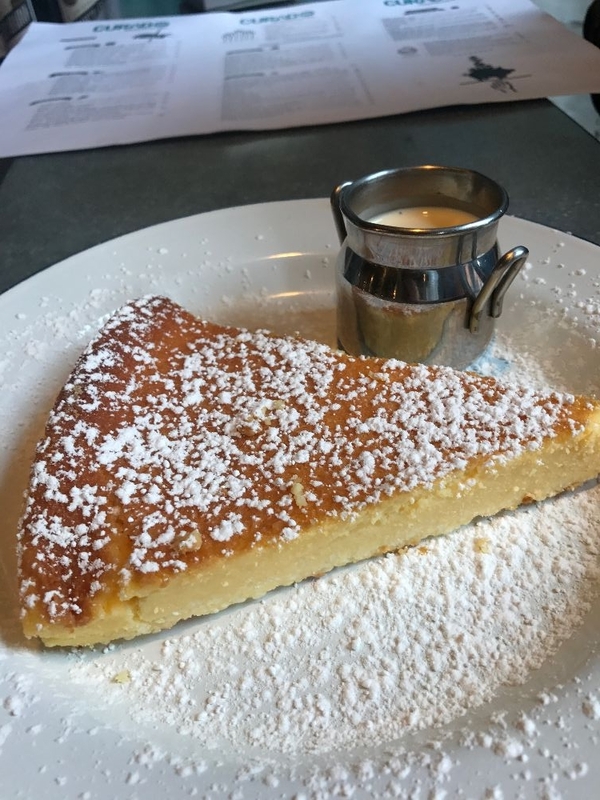 If you asked me to name a traditional Spanish dessert I’d probably be there for a few days thinking to be honest but what I’ve sampled at Curado so far have all been on point. 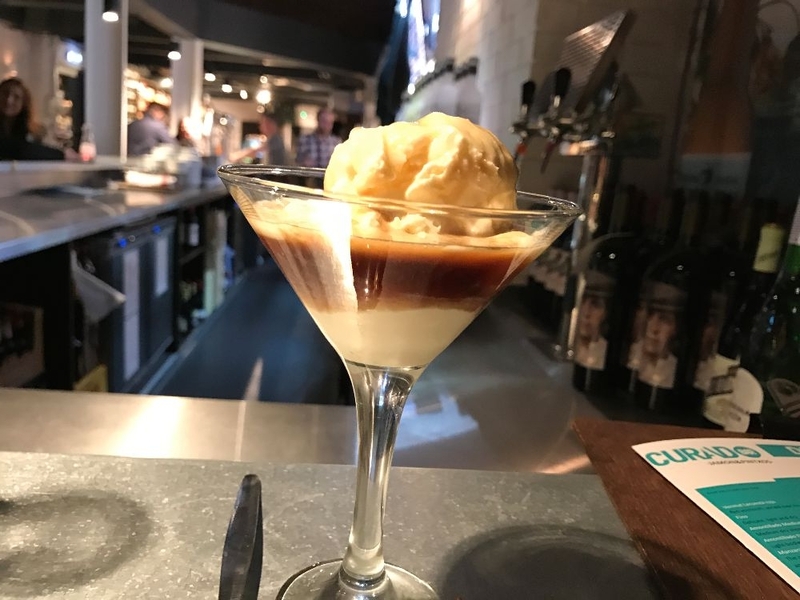 A Spanish take on the Afogato with vanilla ice cream drowned in alcohol namely sherry in this instance but without the hit of coffee. Sweet sherry paired with creamy vanilla ice cream, so simple yet it does the job perfectly. We had the good fortune of tasting the Gacilian baked cheesecake last time we were there and we were hooked. Never tried crack myself but i’m guessing it’s similar to my constant urge to drag myself into Curado every day i pass from work for my next fix of the mystifyingly addictive curdled like cream laden stodge. The first bite is very odd i’ll admit but stick with it kid because it will soon have you stabbing your fork in for another mouthfull. 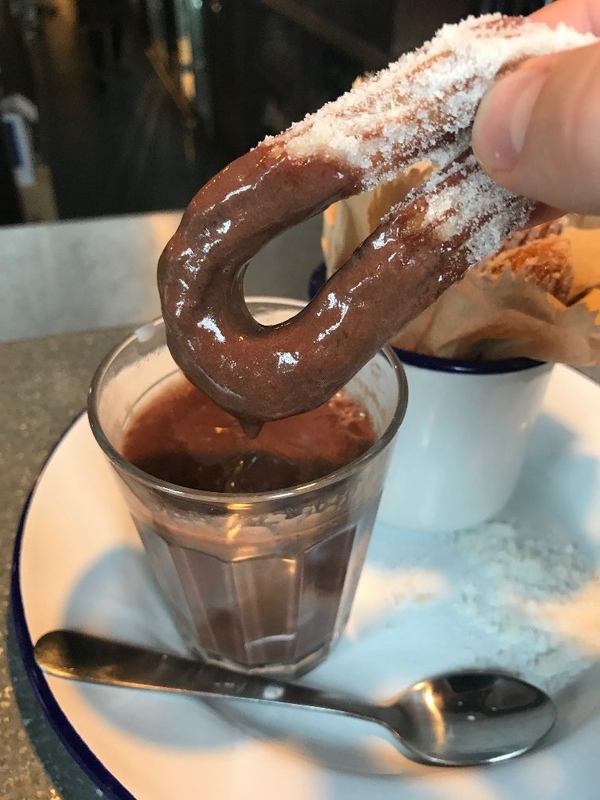 Just because I always love the thought of churros until I see the plastic like chocolate gunk some food festival stalls attempt to pass off as chocolate sauce to dunk the cinnamon and sugar crusted dough sticks in I thought I’d take a punt this time seeing that they know a thing or two about them in Spain. 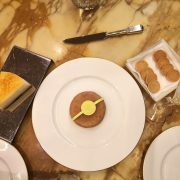 The churros came bundled into a mug, 3 ribbons of crispy doughnut caked in sugar. I like my sweet stuff but I had to give them a few bashes against the plate to get a lot of the sugar off as I would of turned diabetic after finishing them. They were served with a little glass filled with faintly sweetened real chocolate sauce. This was a welcome decision seeing that the churros covered in so much sugar and didn’t really need anymore sweetness. As I’d shared half the baked cheesecake with Mwsh, sadly I had to share my plate of churros and chocolate as I would of easily wolfed the lot down myself. 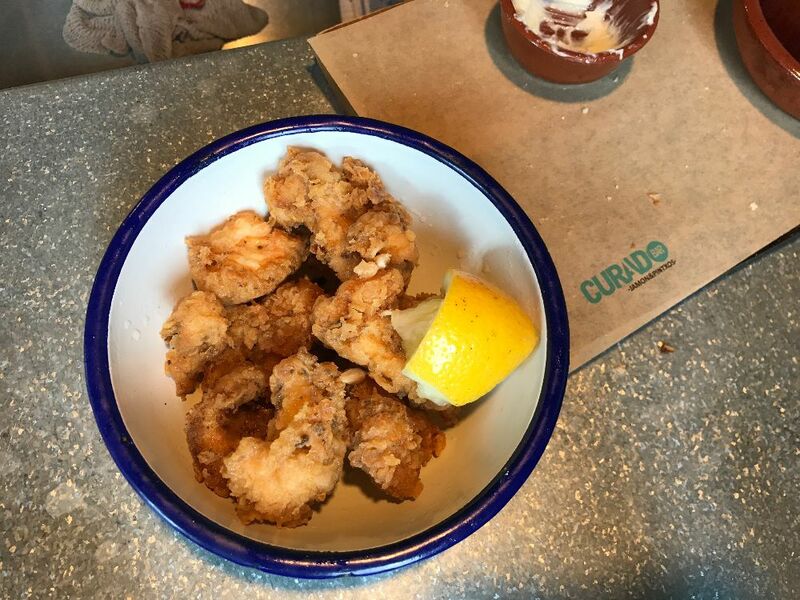 I’d highly recommend Curado as it’s my interpretation of the most authentic tapas bar in Cardiff and surrounding South Wales. Unpretentious, the menu serves exactly what I’d expect in a rural tapas / pintxos cafe in Spain. 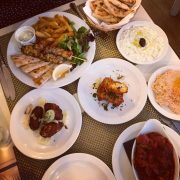 The prices are very reasonable for food there and you won’t go home feeling hungry even with even a small few plates between you. 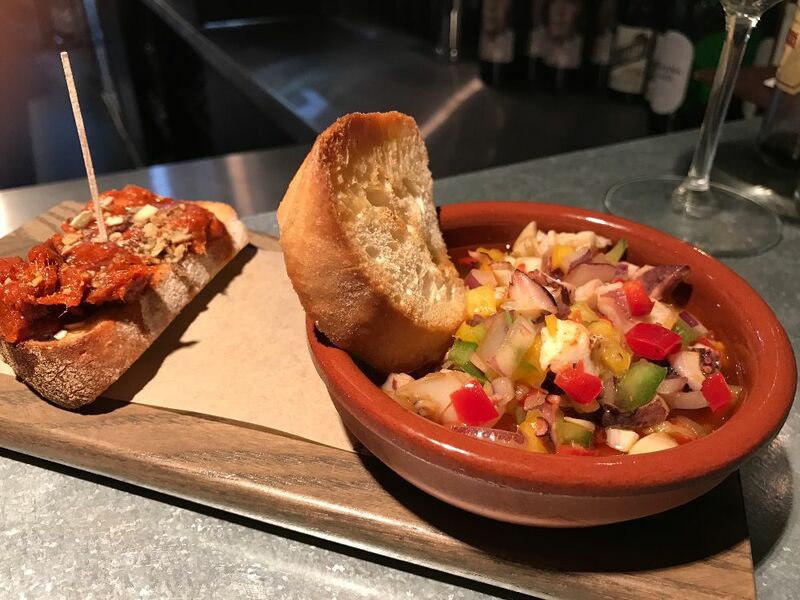 If it’s your first visit I’d try and pick one or two dishes for each section just to have a true tapas experience but remember, you just must order the garlic mushrooms it’s the rules! Prices are reasonable anyway but they do have some regular deals on Wriggle at lunchtime midweek for Cardiff workers like the one advertised on Tuesday 16th May with any 3 basque Pintxos for £4.95 instead of £9 or the one we took advantage of yesterday any two De La Cocina dishes up to £13 for just £6.95. 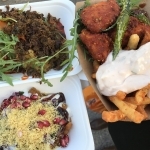 Find out more about Wriggle Cardiff discounts and also get money off your first order with the discount code AUHPSS when you add it to your account under refer a friend > Redeem Code.